It’s true we are not “Christmas, we are Chanukah” to quote something a Blog Appetit kid said years ago, but that doesn’t mean we don’t selectively enjoy some of the trimmings and treats of the holiday. Peppermint plays a role in holiday treats which we especially like. Red and white candy canes look so festive and the frosty, clean, sweet zing of the mint is always appealing. Below are directions for peppermint brownies and one of my children’s all time (and still) favorite cookies – Peppermint Candy Crisps. 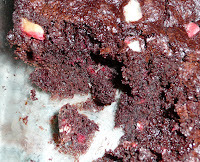 The peppermint brownies are easy and fast. I usually bake from scratch, but one of the few mixes I do use is for a fat-free brownie called No Pudge. (I use the original brownie flavor.) The brownies come out dark and not very sweet, the perfect foil for the Andes Peppermint Crunch Baking Chips I stir into the batter (about a cup or more or less to your taste.) I also scatter some across the top of the batter once it is in the pan and before it goes in the oven. You can use a mix or your own recipe, but be sure to pick one that has plenty of dark chocolate and not too sweet. The Andes bits are peppermint flavored little chunks of white chocolate with slashes of candy cane red. They hold their own in the batter, retaining shape and flavor. (In fact they taste better in baked goods than they do right out of the bag. There’s a bit of Christmas baking magic for you.) If you can’t find the baking chips, substitute some chopped up Andes Pepper Crunch candies. Here’s info on the chips and recipes from the manufacturer. Depending on kids age and ability they can help unwrap and smash the candies, mix the dough, shape the cookies and sprinkle candy bits about with abandon. Kids of all ages will enjoy eating them. You can make these with any wrapped peppermint hard candy. The original recipe called for candy canes which I find tedious to unwrap. 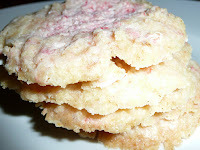 I prefer to use red and white colored peppermint starlight mints which also makes this cookie a year round treat. The original recipe calls for ¾ of a cup of crushed candies which is about one six ounce bag of starlight mints. I found that I only used about half that amount, but I made larger cookies than the original recipe called for and perhaps sprinkled less on top of each cookie. Keep any left over peppermint “dust” to flavor other baked goods, mix into toppings, cocoa or ice cream or to make a sugar rim for a sweet cocktail drink after the kiddies have gone to bed. Or use it to make my peppermint bark rounds. Preheat oven to 350 degrees. Beat butter and 1 cup of sugar in a large bowl of an electric mixer until creamy and then beat in vanilla. In another bowl, stir together flour, oats and salt, gradually adding to butter and sugar mixture. Blend thoroughly. Add ¼ cup of the crushed candy and combine well. (Note: Batter will be very stiff.) Roll into 1 inch balls, then roll in powdered sugar. Place balls 2 inches apart on greased and floured baking sheets. Flatten cookies with the tines of a fork, creating a crisscross pattern on the top (like for peanut butter cookies). Sprinkle each cookie with about ½ tsp of the crushed candy. Bake for about 20 minutes or until the edges are lightly browned. Cool on baking sheets for a few minutes then transfer to racks and let cool completely. Makes 2-3 dozen depending on the size of your cookies and how much dough you taste to see if you got it “right” while you bake! Note: Larger bits of the peppermint candy will sink right through the cookie as it bakes leaving a hole in the cookie and pretty firmly adhering the cookie to your baking sheet. So go with smaller crushed bits. 12.16.10 update: Unfortunately Well Fed's links have not been maintained.. Try this link from the wonderful wayback machine site to see what I wrote. Below is my recipe for the peppermint bark from that post. Line an approximately 10 by 15 inch rimmed cookie sheet or jelly roll pan with aluminum foil. Make sure the foil lining extends beyond the sides of the pan. Unwrap your peppermint candies of choice and put them inside doubled heavy-duty plastic zipper-lock bags. Make sure you get the air out when you seal the bags. Place on a cutting board on a steady, durable surface that won’t be damaged by some candy bashing (we used the floor). Hit and bash the the candies with a rolling pin, meat tenderizer, or even a hammer until the candies are broken into approximately ¼-inch pieces. Melt the semisweet chocolate in the microwave or in a double boiler. Spread the melted chocolate in an even layer across the bottom of the prepared, rimmed cookie sheet. Place pan with chocolate in the refrigerator while you make the next layer. Melt the white chocolate in the microwave or in a double boiler. Take pan with semisweet layer out of refrigerator and spread melted white chocolate on top. Working quickly, evenly scatter peppermint candy pieces (but discard or find another use of those teeny tiny bits of peppermint dust you might have created when you were candy bashing) on top, pressing down slightly on larger chunks to make sure they adhere. Place confection back in the refrigerator until totally firm, about a half hour. Using the foil lining, lift the bark out of the pan. Peel off the foil and break into irregularly shaped pieces. Makes about 1 ¾ pounds of candy. Store in the refrigerator in a sealed storage bag or container.